Leave your mallets lay. Disperse from the darkening field. In the dimming daylight they will approach, one creature at a time, and take their places. With no fanfare, but much at stake, the Second Annual After Dark Lawn Games are hereby announced. Summer of 1993 touts new challenger Roquet Raccoon, the After Dark Garden Club's most entertaining member. It was the dashing poses that drew him to the sport, but standing a mere 14", he relies more on attitude than physique, often diverting an opponent's attention with his mock heroics an then winking from dark glass eyes when the shot is a success. Playful but no clown, Roquet is nimble with the foot shot, which he has been practicing on dusty croquet set in neighborhood garages throughout the spring, stumbling only occasionally. His slender, leather-padded fingers and toes and bushy tail give him the dual advantages of grip and balance, and even Swooning Ginny Opossum is said to be dismayed at the prospects of facing this unflappable player. 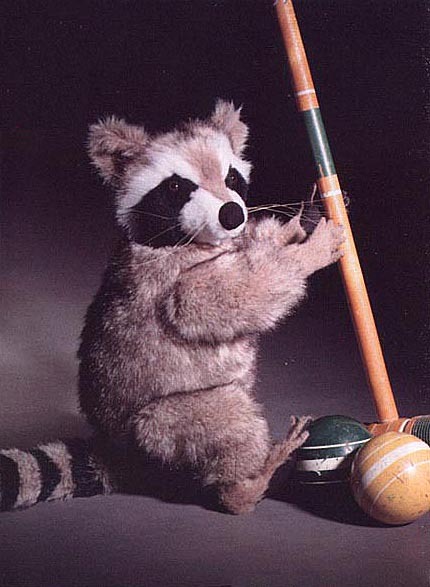 Roquet Raccoon takes him name from a refined version of croquet, in which the court is octagonal, the mallets heavier. In this game each creature plays two balls instead of one, a modification of his own game the eccentric Roquet is contemplating even now.